Yes, there are similarities: the palms, the weather, the traffic. But what makes Honolulu all that special, or unique – or worth the long flight to get there? Where is the “Hawai’i-ness” in Honolulu? I’ve got 36 hours to find out. ($3-$5 for Reyn Spooner, Tori Richard, Kahala, etc). For dinner in Chinatown, try Legend Seafood. Freshest lobster in town: under $25. Vegetarians: Try Legend’s meat-free annex next door. While in Chinatown, try to take in a show at the Hawaii Theatre. Or at least look inside this lavishly restored 1922 treasure. On a recent night, the Brothers Cazimero (island idols) were scheduled to serenade a mostly local audience. Many performances finish with everyone in the audience – yes, including total strangers – holding hands and singing the hauntingly beautiful state song “Hawai’i Pono’i”. You may need a hankie. BTW, where should you stay? 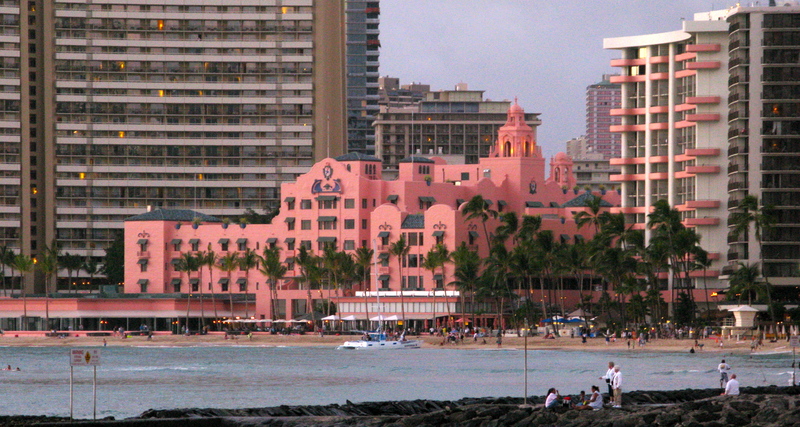 A personal favorite is the Royal Hawaiian, the first resort (built in 1927) on Waikiki Beach, and still the “Pink Palace of the Pacific”, despite what Sheraton has done to usurp its once-lush gardens for more high-rises. The original building has the Royal Hawaiian’s most authentic rooms. 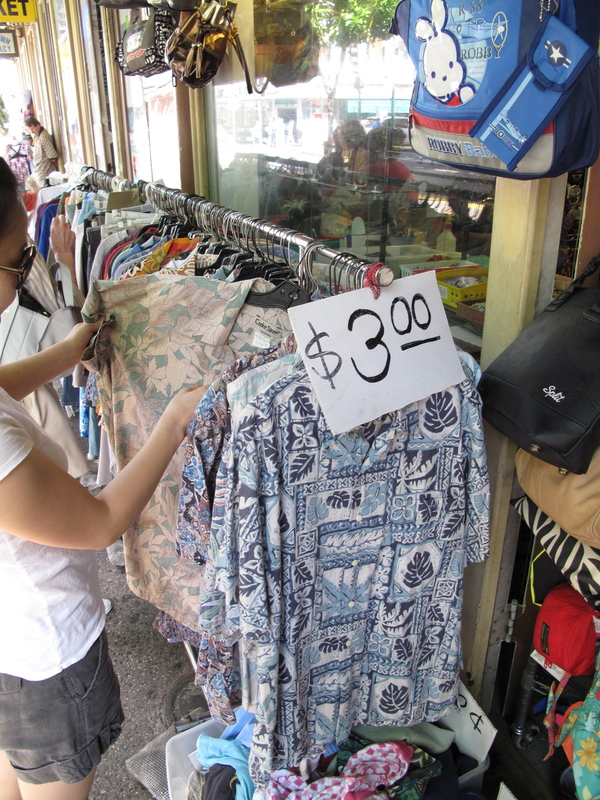 But why spend a lot for a hotel these days, while tourism is down, and bargains abound in Honolulu? Besides, if you spend much time in your room on this trip, you’ve missed the whole idea behind 36 hours here. Eat breakfast early; most places stop serving it too early, IMHO. Loco moco is an island favorite: fried eggs on hamburger patties on top of rice – smothered in gravy. You can almost feel your arteries harden. 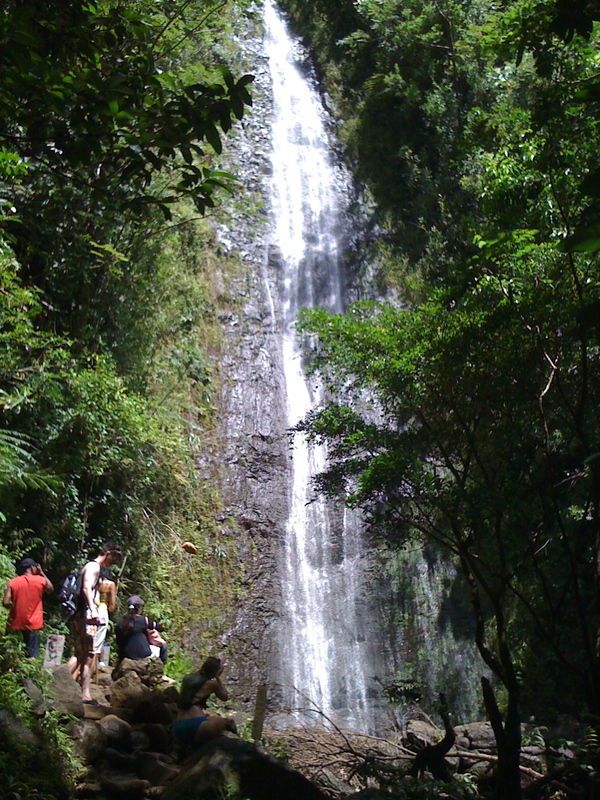 Work that ballast off with a climb to Manoa Falls. It’s a bit hard to find: Up a canyon behind the University of Hawaii campus. But it’s a magical, gentle mile-long climb through a lush rainforest, adorned with tropical flowers, exotic fruits and weird creatures – to a pristine 160-foot-high waterfall. Souvenir vendors at the parking lot will loan you a walking stick for the sometimes slippery journey; be honorable and return it afterward. This place is not overly touristy, even though it is reputed to be O’ahu’s second most popular hike (other than climbing Diamond Head – a worthwhile alternative, if you don’t mind the crowds). For lunch, assuming your loco moco feast has been atoned for, try a Hawaiian plate lunch – usually some kind of beef, pork or fish with “two scoop-a-rice” (plenty of soy sauce) and macaroni salad or a veggie or two. The Rainbow Drive-In on Kanaina Avenue is an authentic hang-out for this. 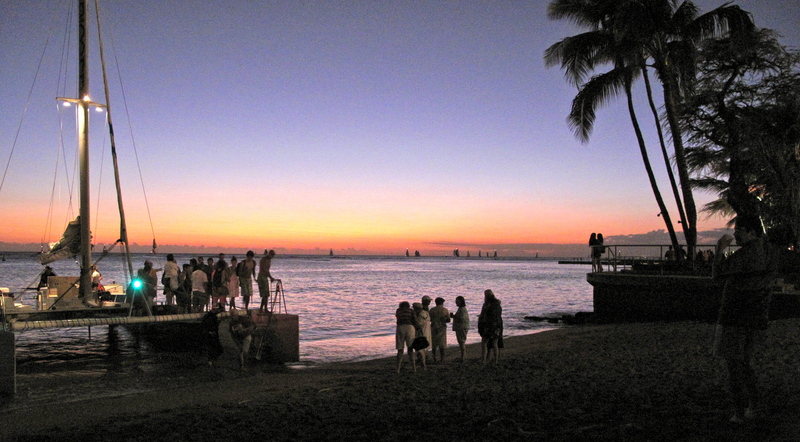 Afterward, take in an arts/craft show in Kapiolani Park (there’s always one), or sample the famous surf at Waikiki. Too many tourists? Water not gorgeous enough? 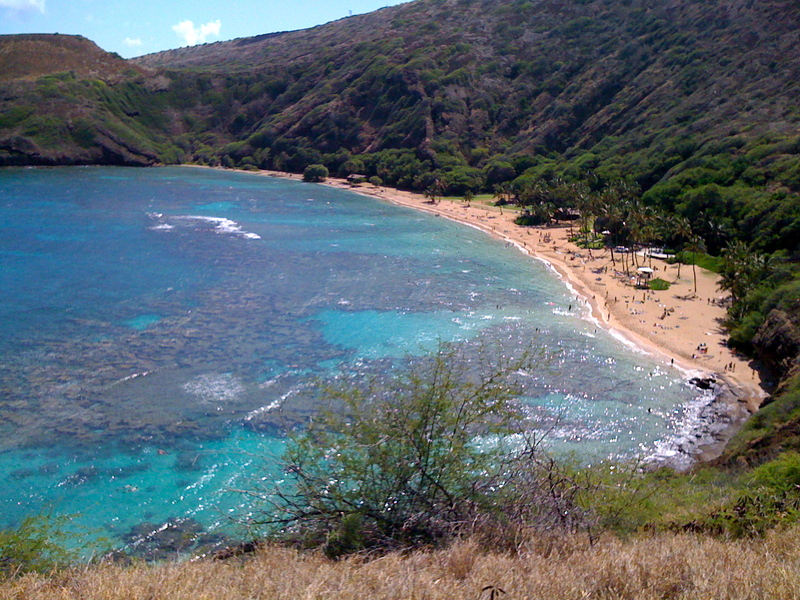 Try public beaches nearby by at Ala Moana park and Magic Island, Papaoneone or pay the $10 admission to Hanauma Bay Nature Park (in a hollowed out volcano crater). Try to find blue water that color in California. 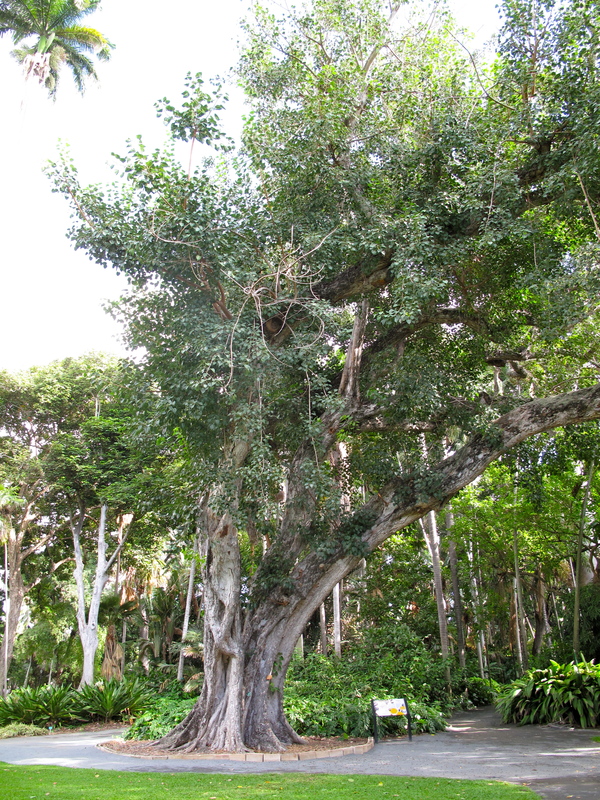 any of the five botanical gardens in town, or elegant ‘Iolani Palace (America’s only royal residence). 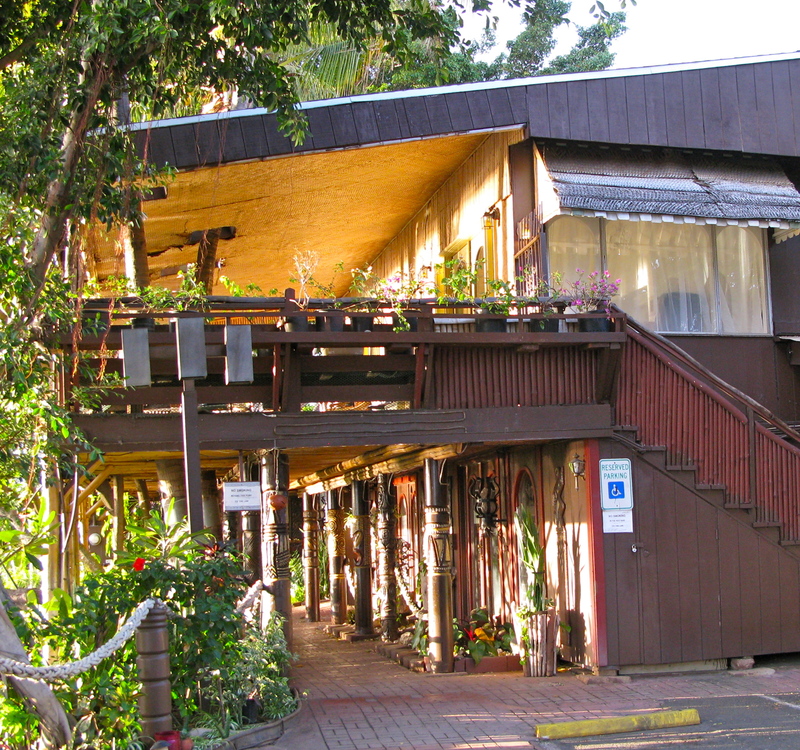 La Mariana Sailing Club – O’ahu’s last honest-to-goodness tiki bar. The iconic and popular proprietess, sadly, passed away in 2008. But her picture and a small memorial still stand guard in the lobby. La Mariana is not easy to find – out behind some steel buildings on the road to Sand Island (another great in-town beach). It is not to be missed. The sunset? You will probably miss it here – because you can hardly see it through the forest of sailboat masts in the marina, tiki god carvings around the restaurant. But, order another mai tai; you won’t care. The food is not as famous as La Mariana’s cocktails (see Mai Tai No. 2 recommendation). An alternative dinner suggestion is the Hau Tree Lanai Restaurant at the far end of Waikiki; locals love it, and they know the menu boasts grass-fed beef from a Hawaii ranch. Almost like dining in Argentina! But $$$$! If you’re still in a romantic or festive mood, try a little dancing, poolside at one of the Waikiki hotels, such as under the giant banyan tree at the Moana Surfrider. Breakfast, seaside at the Royal Hawaiian is unforgettable, especially if you ask the server for their magnificent macadamia nut pancakes (which are not on the menu any more). Served with hot, real maple syrup or lilikoi jelly. 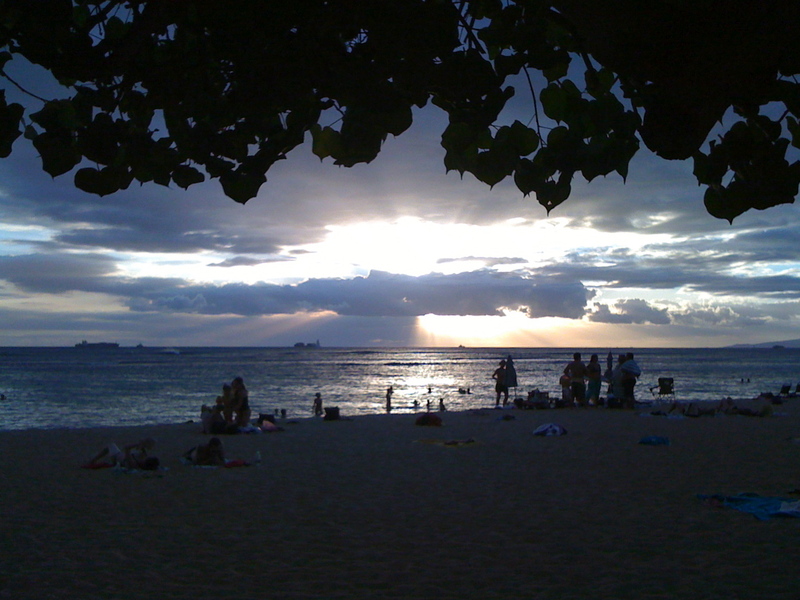 Early risers should not miss a sunrise walk along Waikiki Beach, before the city comes alive. 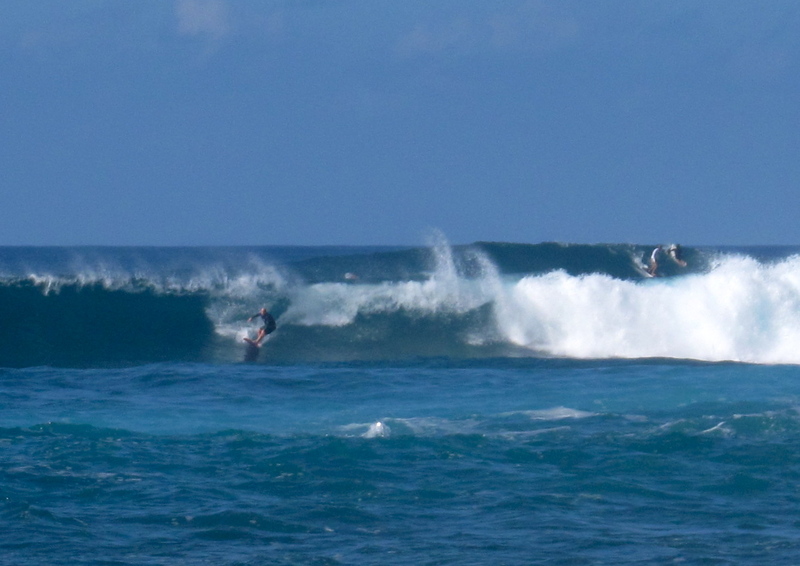 The beach is deserted, seas are glassy, the waters impossibly blue, and the waves perfect. The surf calls to you – like it did to surfing pioneers like Duke Kahanamoku (see his webcam here) and King Kamehameha I (see his famed statue here) – and you’ll want baptize yourself in the calm, warm waters and gentle swells. You are a Honolulu convert now. If you stop for coffee, know that the Starbucks locations here (and only here) sell bags of 100 percent Kona coffee. The ubiquitous Honolulu Coffee Co. is also a good source for Kona. Sharp-eyed shoppers might even rarer beans from Maui, Lana’i and Kauai. You’ll be tempted – and well advised – to take a few bags home. Stock up on macadamia nuts and other silly souvenirs (flip-flops, anyone?) at one of the zillions of ABC Stores in town. Why do they need so many ABC Stores – some of which are next door to each other? Like Hawaii’s raindrops, no two are exactly the same. I’m cheating here on the 36-hour time limit. But you will be sorely tempted too, as well. If you’ve truly tried to avoid the tourist trap luau shows, fire dancers and silly designer shops, you’ll realize at least three things: That this is the one place to experience the original Hawai’i, at its heart, it’s nothing like Southern California; and 36 hours is not enough. I loved the wealth of links you provided in this great 36 hours piece. It is a one-stop resource for any of us who’ve been to O’ahu and want many more reasons to return. O’ahu is a gem that often gets passed over when people talk about the beauty of the other islands. Anyone reading this would be hard pressed to do that in the future.